People have been eating empanadas for centuries. They’re a chameleon-like food, taking on different characteristics from country to country. Go to India and they’ll be filled with dried fruits or nuts. Visit Venezuela and you’ll find empanadas fried and made from corn flour. 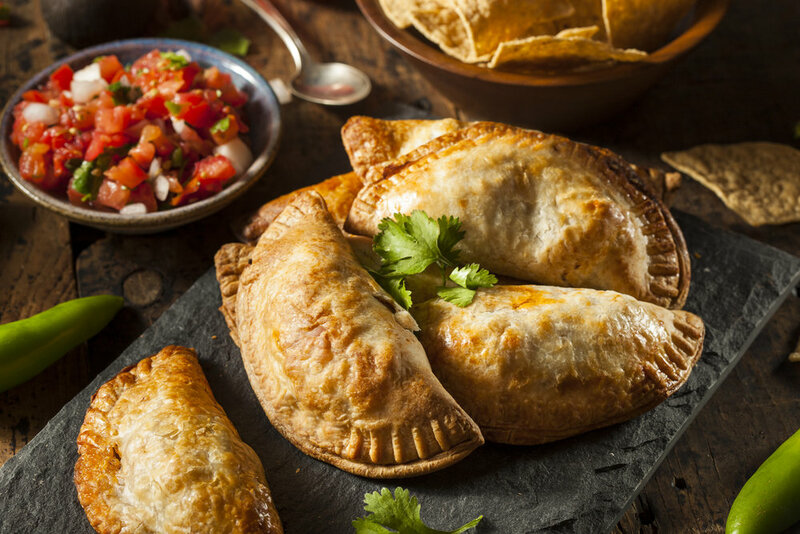 Argentinian empanadas are typically filled with beef and vegetables, although other variations use chicken or fish. For this recipe – by chef Fernando Larroude – we’ll go with beef and red pepper. You’ll end up with enough empanadas for a party. Make the filling by finely chopping the onions and frying them in the beef fat. Add a little of the stock for extra flavor, taking care not to let the mixture get too liquid. Make sure the onions are soft, as the finished product will only bake for 10 minutes. Slice the sirloin into finger-width ribbons, and add them to the onions. When the meat has cooked for a few minutes, add grated egg and a few roughly chopped olives. At the last minute, add a handful of finely sliced spring onions for freshness, and end by putting in chopped red peppers. Season this mixture and allow it to cool before adding it to the pastry. Roll the pastry as thin as possible on a cold, floured surface. Cut the pastry into small discs, and spoon a small amount of the cooled mixture onto each disc. Fold the pastry over, sealing the edges together. Cook for about 10 minutes at 375 degrees, and serve immediately. That steak tasted amazing when it was fresh off your asado grill on a warm September night. But now it’s a cool, rainy day and you want something more seasonal. And what’s more comforting on a dreary rainy autumn day than some stew? This version – courtesy of the food blog Naked Cuisine – might be a little different than the stew you grew up with, but it’s no less soothing. Heat the oil in a large pot until hot. Add the beef, letting the chunks get brown on all sides. Lower the heat and add the onions, peppers, apricots and tomatoes, cooking until soft. Add the wine and let everything simmer for a few minutes. Add the tomato sauce, beef stock, cayenne pepper, potatoes and squash/pumpkin. Simmer on a low heat for two hours and 30 minutes, add salt and pepper, and serve with fresh cilantro. This dish should serve six. If the world of the asado grill is still a foreign country to you, let Gaucho Grills take you there. Our grills can let you cook steaks and other dishes as if you’re at a classic Argentinian parilla. Shop our website to find the grill model that’s right for you, and read our blog to uncover other recipes and cooking tips.